6. 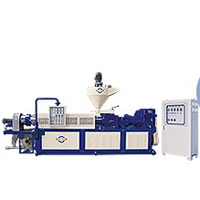 Pelletizing Die Head: pelletizing dies are made of steel alloy with carbonizing treatment; it is fabricated with characteristic of high resistance to acid, abrasion and high temperature. 7. Vibration cooling unit: stainless steel machine frame and multi-hole cooling unit provide as pellet selection during the cooling process. It is also equipped with high power cooling vent.